Oven roasted cabbage is an easily baked cabbage that you are sure to enjoy time and time again. Cabbage and bacon go together beautifully. This cabbage dish is easy to prepare, and it is very healthy. This recipe is Paleo, low-carb, gluten-free, low-calorie, and perfect for keto diets. 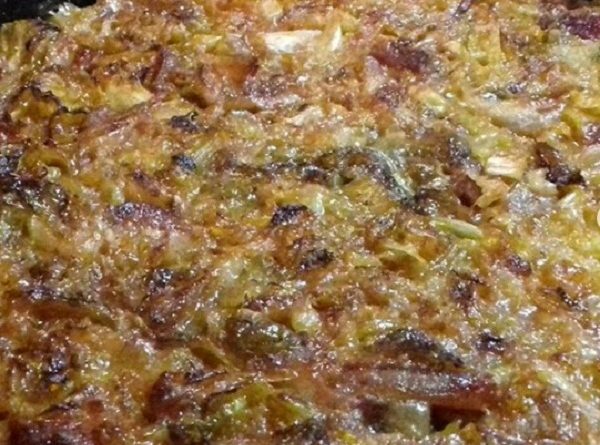 Stir together cabbage, chicken broth, onion, butter, bacon, cauliflower, cayenne pepper, seasoned salt, salt, and black pepper together in a 9×13-inch baking dish.